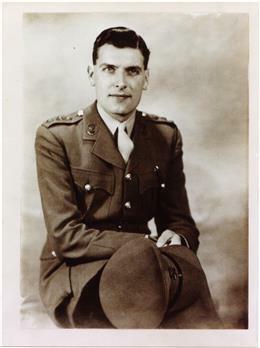 On this date in 1944, British Capt. Victor Gough was shot at Ehrlich Forest as a German POW. His complications were exacerbated when his wireless operator was injured — and the wireless set wrecked — in the parachute jump. The British wireless man was soon captured and their third, a French officer, killed in a gunfight, leaving Gough on his own. “Great difficulty working alone,” he managed to report to SOE headquarters. He was finally captured in October of that year, tortured by the Gestapo, and eventually shipped to the labor camp at Gaggenau. In accordance with Hitler’s anti-saboteur Commando Order Gough was shot at a nearby forest in a gaggle of 14 POWs — six British special forces, four American airmen, and four French civilians. Their fate was discovered in part thanks to a German fellow-prisoner, a former officer in the Wehrmacht who had been sent to the camps for refusing orders to issue his men sawed-off shotguns, a weapon prohibited by the Hague Convention, who escaped shortly before the executions using a British map that Gough gifted him. That Captain Werner Helfen survived the war and gave evidence to a British war crimes investigation. Many years later, Helfen gave something else too: according to Burbidge, his mother — Gough’s sister — in 1991 received a package from Germany containing a photo of Werner Helfen by Victor Gough’s grave, and the escape map that Gough had given to Helfen. * Future CIA director William Colby was a notable Jedburgh alumnus. Fascinating to read about Helfen being in a German labour camp – I wonder how many other Wehrmacht soldiers also spent time in a German labour camp?